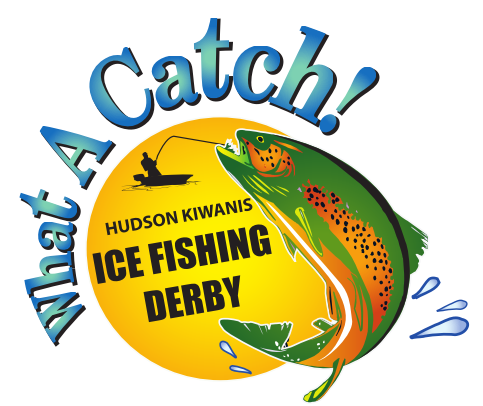 Hudson Kiwanis 31st Annual Ice Fishing Derby on Sunday, February 17th, 2019 at Robinson Pond, Hudson. Sign up from 7:30 AM - 10:00 AM; Tournament ends at 1:00 PM. $10 for Adults; Under 15 is $5. Contest sts 3 hole limit per entrant. Trophies for winners under age 15; Bait available from Licensed NH Bait Dealer. 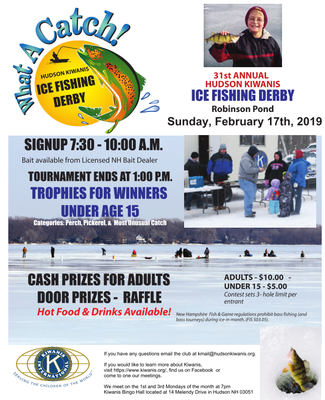 Cash Prizes for Adults. Door Prizes & Raffles. Hot food and drinks available.